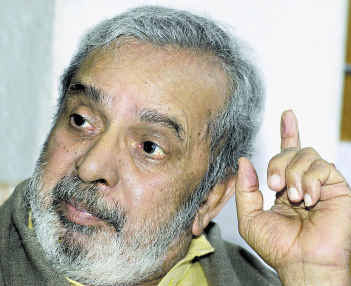 U R Ananthamurthy is one of the pioneers of the Navya literary movement in contemporary Kannada literature. He is a Jnanpith award winner and a renowned academic, who’s well known for his striking literary work. Ananthamurthy was born on the 21st of December 1932 in Melige village in Karnataka’s Shimoga district. He was born in a conservative Brahmin household. Shimoga has a rich tradition of Sanskrit studies and Ananthamurthy completed his primary schooling in a traditional Sanskrit school in Durvasapura. He completed his higher studies in Tirthahalli and graduation from Mysore University. After completing his Master of Arts from Mysore University, he won a Commonwealth scholarship. Ananthamurthy later moved abroad and completed his doctorate from the University of Birmingham in 1966. His dissertation was titled ‘Politics and Fiction in the 1930s’. After moving back to India, U R Ananthamurthy accepted the position of Professor of English at Mysore University. Over the following years, he served as the Vice Chancellor of M G University, Kottayam. His increasing popularity as a critic, litterateur and novelist ensured his appointment as the Chairman of the National Book Trust in 1992 and as President of The Sahitya Akademi in 1993. His stints as a visiting professor at Shivaji University, Cornell University, University of Iowa and Tuft University meant that U R Ananthamurthy stayed out of the country often. He won acclaim as an orator and for his treatise on the poetry of Tao and Yeats. A lesser known fact is that U R Ananthamurthy had a successful stint as an interviewer for Mysore Radio when he interviewed greats like Field Marshal K M Cariappa and Shivram Karanth. He also completed two stints as the Chairman of the Film and Television Institute of India. Ananthamurthy grew up in a very traditional milieu where discrimination between castes and communities was rigorously maintained. His travels abroad and the changing face of India post independence made him question many deeply held beliefs and he developed an affinity towards socialism. Most of his story lines question the traditional hierarchy in the society and the sacred rituals followed in Brahmin societies. He married a Christian lady, Esther, and faced many problems for his inter religious marriage as it was not accepted by his community. Ananthamurthy consciously veered away from writing in English and started writing in his mother tongue Kannada. His of work includes four novels, one play, six collections each of poetry and short stories and five collections of essays. His novels Samskara, Bhava, Bharatipura and Avasthe won critical acclaim, and his play was titled Anveshan. U R Ananthamurthy won acclaim from critics and fans alike. He won the Rajyothsava award in 1984 and the Masti Venkateswara Iyengar award in 1995 from the Karnataka Government. In his later years, he won the Jnanpith award in 1994 and the Padma Bhushan in 1998. U R Ananthamurthy has always been vociferous in voicing his political views, and he put forward a proposal to revert the Anglicized names of Karnataka’s main cities back to their original Sanskrit names. The government of Karnataka accepted this proposal and the first city to be so renamed was Ananthamurthy’s own place of stay, Bangalore. U R Ananthamurthy has been rightly called as one of the 50 best writers in India. His multi faceted personality and command over language have contributed to the mass popularity that he enjoys. Karnataka State Government accepted a proposal from UR Ananthamurthy to change Bangalore to Bengaluru on December 11, 2005. UR Ananthamurthy died on August 22, 2014 in Bangalore.